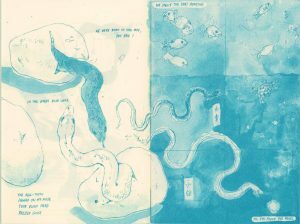 The new Ley Lines books from Czap Books and Grindstone Press are starting to come out, and Jia Sung’s Skin to Skin is the first release of 2018. Jia Sung is a name I associate with Guernica Magazine – her illustrations for that website have always struck me as being simultaneously fragile and fierce. Drawing inspiration from Belkis Ayón, Skin to Skin is a reinterpretation of a classic Chinese folktale called Madam White Snake. 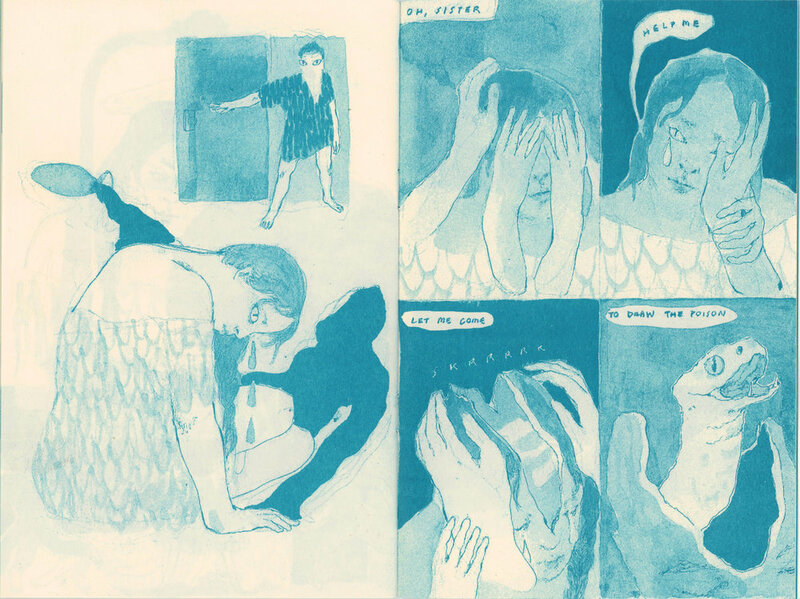 24 pages long and printed on light pink paper with teal risograph, Skin to Skin is a story of sisters that explores themes of transformation and return. The first and most remarkable aspect of Skin to Skin is Jia Sung’s illustration. There’s a messiness to the drawing of Skin to Skin that rewards close scrutiny. Scratches of pencil peek out behind swathes of paint and give the illusion of speed and improvisation. But the effect of the total page is an overwhelming sense of… diligence, as though Sung has studied these images and applied layer and layer of minute changes until the final visual impact is overwhelming. There’s a mixed media approach to the illustration that comes through despite being risograph printed; seeing analogue forms in a more digital medium is odd, but rewarding. 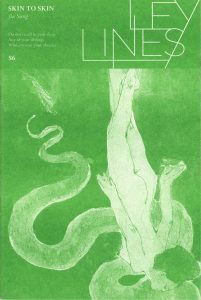 Skin to Skin, and all Ley Lines books, are a sort of fanzine for other types of art. Skin to Skin is an intersection of comics and printmaking inspired by the Cuban printmaker Belkis Ayón. Belkis Ayón was a talented young printmaker who reinterpreted the founding myth of an Afro-Cuban fraternal society called Abakuá. Her work focused on the female aspect of Abakuá’s mythology, Princess Sikan, and subverted their patriarchal symbols by placing women into male roles. 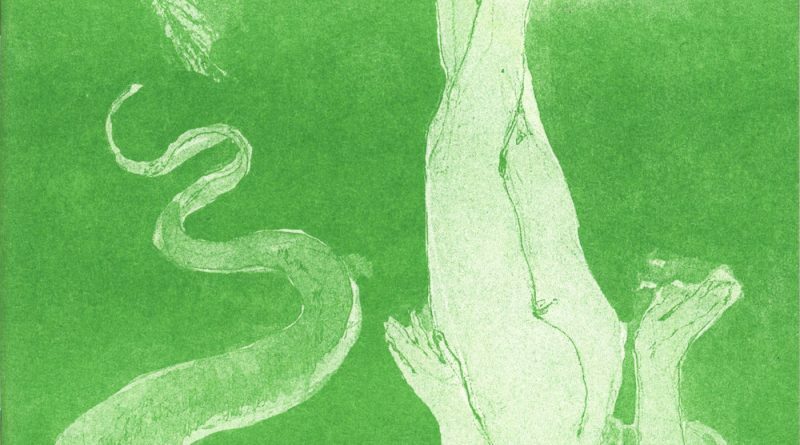 Reinterpretation is the key linkage between Skin to Skin and Ayón’s body of work. Both Belkis Ayón and Jia Sung are taking traditions and traditional stories and reinterpreting them in a clearly feminist way. Belkis Ayón’s work used Princess Sikan as a stand-in for Ayón herself, interrogating a male-only secret society and its culture. Madam White Snake was originally a story of good and evil, and over time has become a story of romance between a snake and a human man. In the original text, Madam White Snake is a story that casts the female snake as an evil creature – only a Buddhist monk turtle can protect the other male (a human) from her witchcraft. Sung has reinterpreted that work as a story about the love between two sisters and their transformation. 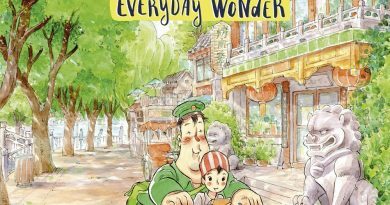 A story where desire is a central tenant has been transformed into a story where familial love takes its role. And in a story where the goal of the snake is to stay in human form to be with her human husband, the story now becomes one of returning to her snake form and returning to the care of her family. Much of the change in Skin to Skin from its inspiration text Madam White Snake is emotional tenor. The actions are similar but the reasons are different. As an example, the catalyst that acts as the breakdown between the snake and her human lover is the interference of another creature from the lake. In its fear of abandonment, a turtle gives the human lover wine that allows him to see the snake’s true form. This attack differs from the original story in root cause but its effect is the same; the new context of Skin to Skin is interpersonal, and not cosmic good versus evil. Throughout the comic, Sung uses language and phrasing that clearly falls in the realm of comics poetry, and I think that Skin to Skin is a remarkable example of how the form is vital as a part of art comics. This is a beautiful and compelling work from a creator I’d love to see more from.